The Microcom DRGS DAMS-NT Receiver system enables users to receive DCP signals directly from GOES satellites. Optional configurations will demodulate METEOSAT and GMS satellites. The system design is based on modern DSP (Digital Signal Processing) technology. 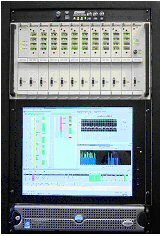 The DAMS-NT Receiver configuration is used with both the DAPS I and DAPS II DCS systems at NOAA's Command and Data Acquisition Station located at Wallops Island, Virginia. The system is composed of three main elements; the antenna, the DAMS-NT Receiver, and the DAMS-NT Software. The DAMS-NT receiver elements are the Integrated Feed Down Converter, Pilot Module, and DAMS-NT demodulator cage. The computer and DAMS-NT Software are discussed in a separate data sheet. Antennas may be selected from 3.6 to 7.0 Meters. Different styles are available depending on the customers budget and technical requirements. 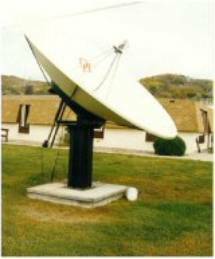 Microcom can install or recommend an appropriate antenna. Output ports on the Pilot Module are available for GVAR and LRITS imagery at 70 MHz IF. A wide band 5 MHz signal and reference are available on BNC connectors. LEDs indicate when the Pilot Module has acquired the pilot or is searching. A signal strength indicator is available for antenna pointing and for use with the optional auto track satellite tracking system. The DAMS-NT cage includes an integral Input Interface Module (IIM) and a Network Interface Multiplexor (NIC-MUX) card. The IIM provides signal conditioning and AGC functions before distributing the GOES DCS spectrum to the demodulator cards. The NIC-MUX receives the GOES DCS message data and signal quality statistics from the demodulator cards, buffers the information, and delivers it to the DAMS-NT Server via a TCP/IP interface. 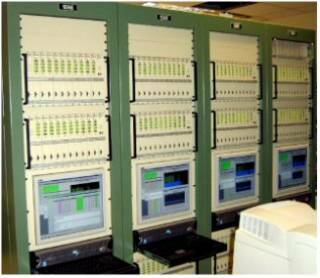 Each DAMS-NT cage can contain up to 40 DigiTrak demodulators. The cage also accepts an IRIG-B time code input from a separate GPS Time Code Receiver to synchronize the time tagging of received messages to within one millisecond. All critical message events, such as beginning and end, are time tagged. A considerable number of reliability features, such as dual power supplies, are employed in the DAMS-NT cage to minimize single point failure. Each DigiTrak demodulator supports any GOES channel for any data rate; 100, 300, and 1200 BPS modulation formats. Auto 100/300 baud detection is also available. · Each cage may contain from one to fourty DigiTrak demodulators. · Microcom’s DAMS-NT Software will support up to four cages (160 total channels). · DSP technology enables software configuration and updates from the DAMS-NT Server. · Real-Time operation with no post-processing latency. · Carrier, symbol sync, frame synch and message end times are all reported. Data input and system configuration are accomplished with the DAMS-NT Software suite that is provided with the DAMS-NT Receiver system. All GOES DCP data ingest and system management tools are incorporated in the DAMS-NT Software. The user friendly DAMS-NT Software utilizes graphical system setup and provides real-time status displays. The user may elect to have the system supplied with just the Microcom DAMS-NT Monitoring and Control software - the same system control and monitoring software used by NOAA - or may elect to include the enhanced database version, which extends the data storage and dissemination capabilities of the DAMS-NT system.